Maradona scores again, this time against George W Bush and US trade policy. The Argentinian soccer star has consistently stood for rights, even for soccer players' labour rights. His recent appearance with Venezuelan President Hugo Chavez, to rally support in the Third World against globalisation, is a reminder that great sportsmen stood up for their beliefs. Sports commentator Dave Zirin reports. If there were a Mount Rushmore of international soccer, Diego Maradona's face would be on it. In 2000 he was named by FIFA (the Fédération Internationale de Football Association), along with Pelé, as the greatest player in the history of the sport. But in his native Argentina, Maradona is a lightning rod for love, hate, brutal criticism and passionate defense. He is Muhammad Ali in 1968 - if 1968 lasted for 20 years. Maradona was in the eye of a media storm last weekend, as he participated in a rally against George W. Bush and US trade policy while Bush met with Latin American leaders at the Fourth Summit of the Americas in Mar del Plata, Argentina. Surely many wondered why this stocky, five-foot-six former athlete was so adored, so incendiary and so intimately involved in a protest against the American President. Maradona went from soccer superstar to Argentine folk hero during the 1986 World Cup, when he avenged the 1982 British defeat of Argentina in the Falklands War. Argentina trounced England four years later with two Maradona goals - one with his foot and one with the sly help of his hand, a score that has become known as "the hand of God." His brilliance on the pitch inspired Latin American writer Eduardo Galeano to write, "No one can predict the devilish tricks this inventor of surprises will dream up for the simple joy of throwing the computers off track, tricks he never repeats. He's not quick, more like a short-legged bull, but he carries the ball sewn to his foot and he's got eyes all over his body. His acrobatics light up the field... In the frigid soccer of the end of the century, which detests defeat and forbids all fun, that man was one of the few who proved that fantasy can be efficient." 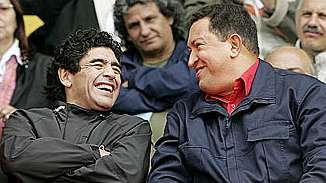 Diego Maradona (left) with Venezuelan President Hugo Chavez. But Maradona, nicknamed El Diego Dios, struggled with hard drugs. He was suspended from the sport for 12 months in 1991 after testing positive for cocaine. Then he was banned for another 15 months for taking the banned substance ephedrine during the 1994 World Cup. In 1997, he tested positive again, and eventually slouched to retirement ashell of drug dependency and obesity. His real sin, however, at least in the eyes of the soccer authorities, was a tendency to speak truth to power. He agitated for international labor standards to be applied to soccer and asked team owners to "open the books" so players could know the profit margins inked with their blood and sweat. Corporate media treated his drug addiction like a national spectacle. When arrested for possession in 1991, it was played live on Argentine television. Mocked by the media for drug dependency (they called him "Maracoca"), weight problems and psychiatric distress, Maradona has come back after on-and-off stays at Cuban health clinics for much of the past four years. Now clean and sober, he has experienced a public resurrection as the host of a popular Argentinean talk show, La Noche del 10. Maradona re-emerged on the world stage this weekend, challenging Bush's global agenda with the same kind of daring that once defined his play. inked with their blood and sweat. In the weeks leading up to the summit, Maradona had urged his viewers to join protests. This included airing parts of a five-hour interview with Cuban leader Fidel Castro, who said, "We are in solidarity with you and with Argentina. We have fought for decades, and we will be happy knowing that you are there." Maradona then arrived at the mammoth stadium protest wearing a "Stop Bush" T-shirt and said, "I'm proud as an Argentine who can travel in this train to oppose the human rubbish that Bush is." Maradona also sat shoulder-to-shoulder at the packed rally with Venezuelan President Hugo Chávez, who had come to the conference vowing to "bury" Bush's proposed Free Trade Agreement for the Americas (FTAA). Maradona embraced Chávez to rapturous cheers as he shouted into the microphone, "Argentina has its dignity! Let's throw Bush out of here!" His stance opened him up to criticism. John Tierney, conservative op-ed columnist for the New York Times, slammed Maradona as a hypocrite who benefited from lucrative endorsement deals with global corporations, yet now condemns the excesses of global capitalism. But what Tierney and his ilk don't understand is that this only endears Maradona further to his people. The poor of Argentina know from bitter experience that, unlike Maradona, they will never taste the fruits of globalization. The fact that El Diego Dios now stands alongside them only cements his greatness. Bush left Argentina last weekend embarassed, off-message and without a trade deal. That's hardly surprising. When a former Major League Baseball owner like Bush squares off against a soccer deity in Latin America, you don't need the sports pages to discover who has the greater claim to the hearts and minds of the people. The Fourth Summit of the Americas will be remembered as a moment when a certain frat-boy smirk was wiped off the face of the American President by those who oppose US trade policies - with a little help from the "hand of God." Note: Dave Zirin's new book, "What's My Name Fool? Sports and Resistance in the United States," is now in stores. You can receive his column, Edge of Sports, every week by emailing edgeofsports- subscribe@zirin.com. Contact him at whatsmynamefool2005@yahoo.com.